The Boar Folding Knife - There was such a natural progression for us by making a folding knife and we think we have done an excellent job with the Boar. 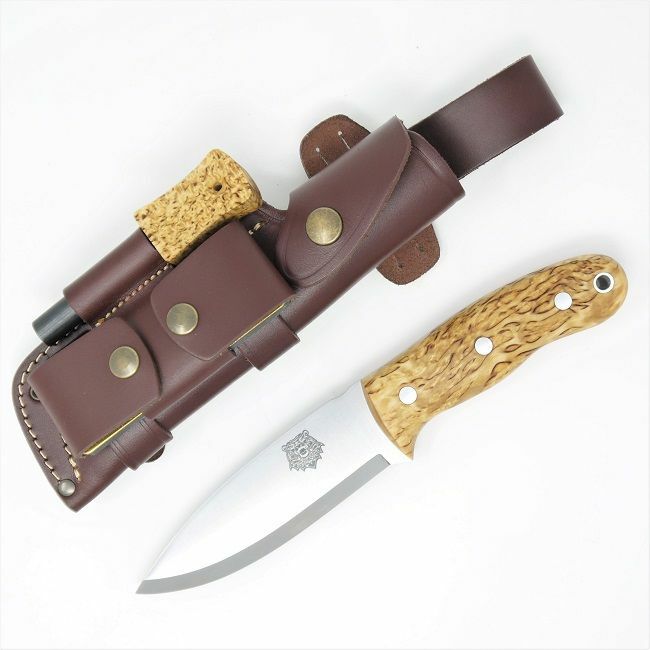 It has some great qualities and is a perfect carry for anyone that doesn't want a full size fixed blade knife. There is a choice of Steels used in these knives, you can either have K720 High Carbon Tool Steel or N695 Stainless Steel. High Grade Bohler K720 High Carbon Tool steel is one of the toughest steels out there and is used widely to make high precision tools that need to stand up to some serious punishment. High Grade Bohler N695 Stainless steel which has a high hardness and great wear resistance and is one of Bohlers premium stainless steels. We have decided to make a variant of our knives in this steel as, after quite some testing, we have found that it performs extremely well. It has a higher Carbon content that many other stainless steels which means it holds an edge longer and can be tempered to the same degree as Carbon Steels. This particular steel actually has a higher content than many High Carbon Tool Steels. This makes it perform with pretty much all the benefits of Carbon Steel with the added bonus of great corrosion resistance. We have deliberately selected very high quality steels for our knives, it may make them more expensive but it is something we weren't prepared to compromise with. The blade has a full "Scandi" grind to it that is wickedly sharp straight out of the box. There are big benefits to having a proper Scandi grind to a knife and these are mainly to do with edge maintenance. A Scandi grind essentially means that the whole bevel of the knife is the edge (there is no secondary bevel) so when it comes to sharpening life is made very simple. When sharpening you can simply place the entire knife on the stone, roll it up onto the bevel and you will always achieve the correct angle for sharpening; MUCH easier than a knife with a secondary bevel! It is handled in a choice of materials - Super Grade Curly Birch, Turkish Walnut, Natural (brown) Micarta or Olive Wood which are all great materials for the task as they not only look great they are VERY easy to maintain. The handles are also wonderfully ergonomic and full size which is rare in this type of knife. They fit the hand perfectly for hours of hard work. The belt pouch that is an option on this model now is our own design and is impeccably made from high grade leather and is thicker and more robust than before. It is a full cover type belt pouch and is designed to hold the knife with or without the press stud. This is a design feature to ensure that you do not lose your knife on the move and, as such, each pouch will be very close fitting. The pouch will "break in" and soften over time like any good pair of boots and we find that the attachment of a lanyard to the lanyard hole of the handle is a good addition to aid in removing the knife from the pouch. Our knife range is manufactured from high quality European materials by a top, well, known, European manufacturer in small batches; they are NOT churned out in their thousands in a factory in the Far East. This allows us to have ultimate control over quality and materials and we are extremely happy with the results. All models of knife will be logoed with the Boars Head. Lifetime Guarantee against any defect in manufacturing, material and workmanship.